NaNoWriMo.... because I'm sure you want to read about my concerns again! Well... this November I'd pretty much decided I was going to write a murder mystery. But now... I'm not so sure. I tend to work faster when I've only got the beginning and the end and maybe the middle point mapped out.... and over plotting is actually what killed me last year. Unfortunately, mysteries require a ton of plotting. And I'm really just not quite up to it. Sadly, I've got a lot of fun characters planned for this story. I recycled a lot of my old ones that I'd forgotten about (Elsie, Vermeer, and M.D. the Nurse, just to name a few!) and I think I'd have a lot of fun playing with them and re-discovering their quirks. On the other hand, Mysteries are mostly plot-driven, and I pretty much always have more fun while working on a character-driven story. Last night A.C. and I caught a jar of fireflies. At our house in the Boro, fireflies are elusive and there aren't that many of them. Firefly catching is a very fruitless sport. Here on Chigger Hill with our Nana and Grampy, however, the fireflies are everywhere. I had so much fun. I haven't caught a firefly since my visit to Amish Country a few years ago, and I'd forgotten how much fun it could be. And the best part, by far, was A.C. trailing behind me, carrying the jar of bugs and whining, "Chloooooeeeeee, you're a bad catcher. I need more firebugs!!" I missed her a lot. I've only driven the Gator once, and that was yesterday. It was actually kind of fun, but I still don't plan to get a license anytime soon, despite the fact that every member of my family is practically begging me on bended knee. Last but not least..... I ate breakfast, lunch, dinner, and snacks!! I'M GOING TO LIIIIVVVVEEEEE! Yay! Anyway, I suppose I shall simply have to live with my obsession for now, and get back to drawing my latest book cover which, by-the-way, features a red scarf. Well, I haven't posted in a while! Hello, people of earth. I'll start by saying that my lovely, amazing, beautiful, perfect, awesome, gorgeous, kind, sweet, innocent and in all other words just really cool siblings, whom I happen to really miss, are STILL with my Nana and Grampy. I literally have not talked to any of them for over a month, simply because they are having such a good time that they can't find the time to talk to me. Okay, so guess what I did last Wednesday? I went and saw Harry Potter and the Deathly Hallows Part 2 with Kievan and Greta! It was amazing and wonderful and stuff! I'm really really depressed now though, because when you think about it, this really IS the end of Harry Potter. It's like, the end of a great era. It's like, signaling the end of thousands of teenagers' childhood. It's like... the grand finale to a brilliant story. Anyways, my favorite parts about the movie was... like.... everything. I didn't particularly like the parts where the movie strayed from the books... but those parts were far and few between. I cried pretty much the entire time, which would have been embarrassing except that everybody, including my sister Kievan (who has a heart made of lead when it comes to sad movies), cried at at least two parts. (Except my friend Greta, who actually doesn't cry at movies. Lucky.) After the Prince's Tale (those of you know know Harry Potter well already know what I'm talking about) I dried all my tears, blew my nose, and mentally decided not to cry anymore. I'd actually decided not to cry after that part hours before, and had mentally prepared myself for every sad aspect of the entire movie. (Or so I thought.) So, anyways, there I was, totally ready to not cry any more, when Harry took the snitch out of his pocket, and it said, "I open at the close." It's always about the middle of July that I start thinking, "Wow, why do I do this kind of thing???" It's the middle of July, and I am so thinking, "Dude! Why do I do thins kind of thing???" So anyways, I'm off to planning!! After all, there are only 113 days and 9 hours until it all begins!! Do you know how long it takes to write 365 haikus??? It takes forever!! I'm not joking. I love writing them, but this is just crazy. I'm not even sure I have a whole 100 of them yet, 'cause I write them everywhere. Seriously... in my literature textbook, on my many blogs, in random notebooks, and a few actually where they're supposed to be. The hardest thing about writing haikus is actually sitting down and writing them, though. Ideas for my haikus are also hard to come by. Luckily, I've written so many that syllable counting and idea summing-up isn't hard at all. So this morning I woke up, still super tired and ready to crumble into a million pieces. My mother walked through the room with a cup of her "motivation" (a.k.a. 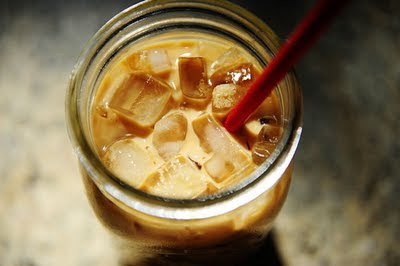 Pioneer Woman's Iced Coffee). About one hour later, I was still ultra-groggy, very sore, and a little bit grouchy. So I sit at my mother's desk and randomly take a sip of her still icy coffee. Then I took another. And another. Now, about twenty minutes later, I am SUPER MOTIVATED to do anything and everything, and I've already accomplished more in these twenty minutes than I did the entire rest of the morning. Who knew coffee could make me so hyper, right? It's time to grab the little red, white, and blue flags!! Tomorrow is the birthday of two of my characters, Jean and Dan LaRue. (twins. ;)) Happy almost your birthday, imaginary people!! !